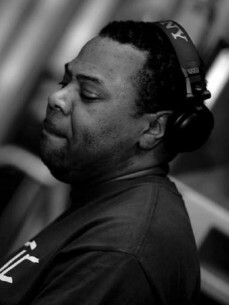 I am a London born DJ / Producer & Percussionist and I come from a musical family background going back as far as 1978. My half brother and uncle were major players in the British Funk Scene (Hi - Tension). At an early age I was taken by the band to studios and rehearsals live gigs etc, and was given a full insight into the Music Industry as it was happening, and this was where it all began for me. I would work after school and saved money to hire studios to record compositions with friends while learning to play the trumpet and drums I formed a group called TLC with Antonio Raggafunk Soundman (producer for Don-e) and Rowan Wilson (producer for 90s pop band Eternal). The band eventually split to pursue other ventures plus after all we were very young. I continued learning drums and percussion but dropped the trumpet but I was confident enough to write songs and pitch them to my brother's band, whilst frequenting studio sessions and live shows to learn the business from the inside. In the late 80's I would be found at the decks of Time Radio in London spinning Soul, Jazz, Funk and Rare Grooves doing the graveyard shift 3-6am Mon - Thurs before a full days work as a toolmaker in a factory that made masks for fighter pilots. That slowly faded away with hassle from the radio authorities, and stations like Medina and Girls FM came about which specialized in House & Hip Hop and this is where I met Jack Smooth a friend and a dj I respected and knew I would have for life who shared a common interest making our own House tracks. Six months later we had both left work and were driving around the country selling our own productions (Wax Factory Productions), out of the boot of the car. This was one of the first UK independent dance labels back in 1990 which gave us the opportunity to meet & engineer for the likes of Carl Cox, Colin Dale, Rocky (xpress 2), Rugged Vinyl and a lot more of the dj/producers of the 90s. As hard as we were working back then there still wasn't enough money between us to live so we started individual labels, and so my first label was called Baby Blue Records but it wasn't what I wanted it to be. After 11 releases on Baby Blue I rested the label because I knew I was not being honest with myself as regards to what was being produced for the label, it was the time of rave tunes and I didn't want to do that anymore, my heart was into more meaningful music so I decided to have a look around the rest of the world at what was going on. It wasn't real in my mind to think that djs around the world were playing my productions but it was happening and that's how I met Mike Huckaby in Detroit in 1993, and on the strength of Chris Simmonds Project on Richie Hawtin's Definitive Records I became head of music at Cross Section Records with my girlfriend & business partner Lorraine Kempster who later became my wife. So with all the musical influences and new talents I have enjoyed listening to along the way I wanted to include them in this project, as a way of saying thank you & be proud that I have accomplished something is not all House but showcases all the other kinds of music that I also enjoy to record. So here's the birth of Adventures In Mechanical Funk!